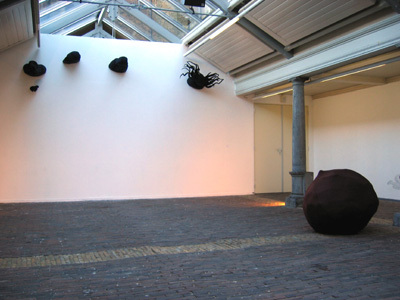 Installation at the rear wall of the Vishal in Haarlem as part of the exhibition 'De Mensch" in the Vishal in Haarlem. Three of the four black objects are based on Saints: Hildegard von Bingen from Germany in the Middle Ages, Saint Cornely from France, protector of cattle and abolisher of sacrificing lambs in the catholic church, and Kwan Kung, chinese warrior god. The fourth black object is my 'free girl' with her hair flowing in the wind. On the floor is my 'Selfportrait as stone', also made of fabric on a frame.